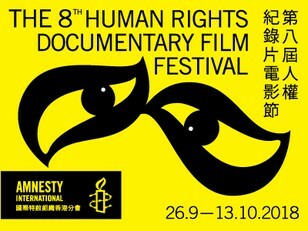 Amnesty International Hong Kong has hosted the Human Rights Documentary Film Festival since 2011, and it is the first film festival in Hong Kong with human rights as its theme. This year marks the 8th Human Rights Documentary Film Festival, through which we continue to bring out different human rights issues around the globe, and deepen the local audience’s knowledge of such issues. In 2018, human rights for people around the world are confronted with increasing challenges. Human rights defenders in different places stand firm on their principles and beliefs; yet with only their hard work, humanity in its indifference can hardly walk out of the woods. Hence, the theme of the film festival this year is “We Are Watching”; through presenting the stories of human rights defenders, we seek to bring the audience together to the frontline, to keep human rights conditions under watch, to defy the odds, protect human rights, and resist authoritarianism. This year’s Free Community Screening film is “Free Speech Fear Free”. What are teenagers most concerned about nowadays? Ramsay has been laying the groundwork for this project to pose his big question to the world since he was 15 years old, “Will we still be whole if we do not enjoy the freedom of speech?” During the 5 years of filming, he has interviewed high school students of his age, CIA whistle blowers, English actor Jude Law, editor of WikiLeaks Assange, Belarus cultural workers, British journalist Sarah Harrison who once assisted Snowden in his whistle blowing campaign, C-BASE, media artist and free-speech activist Diani Barreto, and his 11-year-old daughter. This film was the DOCUTAH Raven winner for Best Foreign Film. Guest Speaker for Post-screening Sharing: Members from "睇政 Seeing Politics"